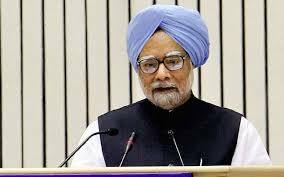 "My advice to the prime minister is that he should exercise due restraint becoming of the office of the prime minister," Manmohan Singh said. Former prime minister Manmohan Singh had a word of advice for incumbent premier Narendra Modi on Monday, saying he should exercise restraint when he visits states not ruled by his party and set an example with his conduct which should be consistent with his obligations as the PM . Singh was speaking at the launch of a book "Fables of Fractured Times" by former union minister Manish Tewari where former Jammu and Kashmir chief minister Farooq Abdullah was also present. Asked about his advice to the prime minister at a time when the level of public discourse was falling, especially during elections, Singh said whenever he as prime minister used to go to BJP-ruled states, his relations with chief ministers were "very good". He said Madhya Pradesh Chief Minister Shivraj Singh Chouhan would certify his claim that during the UPA rule, BJP-ruled states were not discriminated against. "The prime minister, when he goes to states which are ruled by parties other than to which he belongs, I think, has an obligation not to use language of the kind which has now become a common practice," he said. "So what I would say is that the prime minister of the country must set an example... he is the prime minister for all citizens of our country and his conduct must be worthy and consistent with that obligation that he/she has as prime minister," he told the gathering. Singh also recalled that he was asked earlier if he would again used the words against Modi that he had said in 2014, and added that he would "not repeat" them. He had reportedly said that it would be a "disaster" for India if Modi became the prime minister. The Congress has been questioning Modi over his aggressive campaigning during assembly elections where he has attacked state leadership of rival parties, saying such conduct does not behove a prime minister. But the BJP has dismissed the criticism, saying the country has got a "talking Prime Minister" and the opposition fears his popularity among the people. Senior Congress leader Jairam Ramesh had earlier said that Narendra Modi was "not prime ministerial" in his election campaign as he indulged in "falsification of history and abuse of political rivals". He said Modi should not demand respect but should command respect of people as prime minister.